Also in the deal, Toyota's subcompact subsidiary Daihatsu will supply Subaru with the Coo compact. For sale in Japan only, Subaru could sell the re-badged Coo as early as next summer and expects sales to hit 6,000 a year according to Asahi. Daihatsu and Subaru already have a similar venture in Europe where a re-badged Daihatsu, to be named the Subaru Justy, is set to hit the European market this fall. Here in the U.S., Subaru's Indiana factory has been making the Toyota Camry since April of this year. Perhaps using the Subaru AWD drivetrain coupled with nice design from Lexus...? Hopefully the symmetrical all-wheel drive is standard and the woefully numb steering is not an option. Call me in 2012 when we get it here. So would this be branded as a Toyota, a Scion, or a Subaru? How many years have we heard about "the return of he supra" rumors ?? The Toyota board announced in July 2007 that they had created a special committee dedicated to creating interesting cars. Of course a committee with that target in mind is bound to spark rumors of all kinds, and today word comes from Toyota that an interesting car is on its way. Toyota (or Subaru) mentions no specifics in the press release except that it will be based on an entirely new platform, powered by Subaru's horizontally-opposed boxer engine with rear-wheel-drive and should arrive in dealerships by the end of 2011. The new compact sports car will be branded as both a Toyota and a Subaru and will be built in Subaru's yet-to-be-built Gunma manufacturing plant. In return for building Toyota's 'fun to drive' compact sports car, Subaru will receive a small car on OEM (Original Equipment Manufacturer) basis from Toyota and a minicar (sub-660cc engine) on OEM basis from Daihatsu, a subsidiary of Toyota. Its a win-win-win situation for all three companies involved. Toyota finally returns to a market which has not been there strong point with a car built by performance specialists, Subaru gets to focus on doing what they do best and don't have to worry about the small and mini car segments without pulling out while Daihatsu can increase production significantly and improve efficiency. Subaru will build a new plant in the Gunma Prefecture in Japan where the new compact sports car will be built, the current Gunma Main Plant will focus on the OEM vehicles. Daihatsu will supply Subaru with 6,000 Coo cars annually. What the new sports car will be called is not yet known, so plenty of room for speculation there. Will Toyota bring a futuristic styled car like the FT-HS Concept to the market or will they too go down memory lane and return by resurrecting the AE86, Celica or Supra nameplate? Same goes for Subaru, they too have classic nameplate that could make a return like the Leone (Subari GL or L Series). There is no denying that retro styled cars are a big business, just look at the MINI, Fiat 500 and the American muscle cars. One topic of debate that began raging after Toyota and Subaru officially announced their collaboration on a lightweight, rear-wheel-drive coupe was how the Toyobaru would be marketed, particularly with both brands getting their own models. Apparently, Subaru execs share our concerns. Subaru has branded itself as the purveyor of competent, multi-purpose vehicles that begin and end with one distinct feature: all-wheel-drive. By adding another vehicle into its lineup lacking that core trait, Subaru risks diluting its hard-earned image, not to mention going toe-to-toe with the Toyota monolith by selling a badge-engineered variant. Automotive News spoke with Fuji Heavy Industries overseas sales chief, Mat Nagato, who said, "We may lose our longstanding territory, or we may lose the great niche brand image. The potential risk is there. We have to be very smart on marketing strategy." This issue has to be weighed against the short-term gain of a new, inexpensive model for enthusiasts and Subaru's continued growth, but the simple solution would be to nix the Subaru version altogether, allow Toyota to brand the new coupe as its own and rake in the cash provided by the partnership. Unfortunately, that's not going to happen, so the only thing Subaru can do now is make an attempt to differentiate its own version from Toyota's, while praying that consumers won't forget what "Makes a Subaru a Subaru." Last edited by is300eater; 04-21-2008 at 03:26 PM. if its not AWD. JUST MAKE IT!!!! TOKYO — As if paying homage to Subaru, Toyota is co-developing a new lineup of rear-wheel-drive sporty coupes employing a revised version of the Subaru Impreza's platform, boxer engine and transmission. Toyota's largest contribution to the mix will be product planning and its impeccable quality control. The Toyota model, still to be named, will be sold exclusively in Japan, while the Subaru-badged model will be marketed worldwide. The mechanical package will be identical, but both Toyota and Subaru will create exterior designs to differentiate their cars from each other. The basis for this new radical project is to take Subaru's well-known 4WD powertrain and modify it to create a new rear-wheel-drive setup. Slated to be built at Subaru's Gunma plant in Japan, both Toyota and Subaru models will employ a revised version of the naturally aspirated boxer 2.0-liter unit generating around 220 horsepower at 6,500 rpm, mated to a six-speed manual gearbox from the current Impreza WRX STI. Surprisingly, the joint Toyota-Subaru R&D team has chosen the out-of-production, front-wheel-drive Honda Integra Type R as its benchmark, because its styling, performance parameters and dimensions mirror what the development team wants to create. Expected to ride on a 103-inch wheelbase, the 2,866-pound coupes will use a 2+2 seating configuration. Slated for a late 2011 debut, the coupes are expected to be priced starting just under $20,000. TOKYO — Toyota's largest contribution to the mix will be product planning and its impeccable quality control. yes, surprise for me as well, but, definitely see their reasoning. why don't they just resurrect the Celica? ...still say Mazda should have collaborated with Subaru to get an EJ under the hood of the current RX8. ok does anyone have a pic of this new creation to be? is there a prototype or anything? I love Sti's and Evos and thought the same. Slap the technology into a cool looking lightweight coupe and you have a winner. Make AWD an option to save weight and cost. There's a pic in the article I linked. Aside from the color scheme, it looks pretty good. It seems Toyota and Subaru are working on more than just a rear-wheel-drive sports car. According to AutoExpress, the two companies are also teaming up to produce an aggressive looking Impreza Coupe that will go into production in 2010. The project will also spawn a successor to the Toyota Celica. The Subaru Impreza Coupe will take major styling cues from the five-door model but with a more aggressively designed rear end. An entry-level model will forgo the four-wheel-drive system for a more lightweight and less expensive rear-wheel-drive-setup. Subaru will offer the Impreza Coupe with two engine choices including a 2.0 liter flat-four boxer producing 180-hp and a 2.5 liter turbo from the current Impreza STI producing close to 300-hp. This is where you get sad and think to yourself “Let me guess, the U.S. won’t be getting one,” - well we’ve got some good news for you. 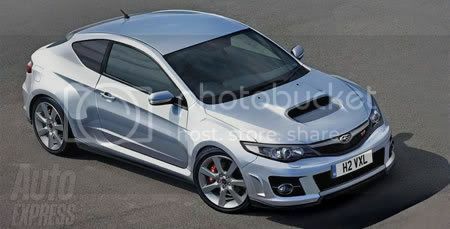 Subaru is expected to launch the Impreza Coupe in Japan and U.S. in late 2010 with UK sales to begin in 2011. Gah... that actually looks pretty cool. actually even the wrx engine would be good enough..
That would be sweet, a turbo flat-4 MR2. A 2+2 that only weighs 2800 lbs though? I know the MR2 Spyder was a featherweight but that car is gonna be small! Bring back the MR2! With t-tops! ^That would be hot! But also bring back the MR2 with t-tops!